Virtual Tours enable a website viewer to explore a property, residence or office interior, or any other site that you may want to show them interactively – as if they were there. The Virtual Tour Panorama allows the viewer to look around a full 360° and zoom in closer to areas of interest by using their computer mouse. We produce these for our client’s websites, to add to the photo galleries and other interesting content. Examples of Virtual Tours are shown below. After you click on one of the buttons, a pop-up window will contain the virtual tour. You can use the controls along the bottom of the picture, or drag and zoom with your mouse. We recommend that you click on the last button on the right at the bottom of the picture to open it up in full screen mode. The details are easy to see, and the impact is much better. This is a luxurious swimming pool, with a swim-up bar at one end. The Virtual Tour Panorama was taken from inside the bar, scanning the pool and it’s surroundings. 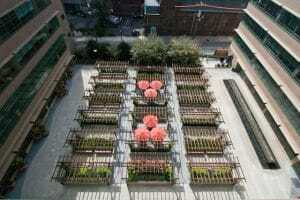 This is a park setting in a large courtyard between large office buildings in Philadelphia. The Virtual Tour Panorama was taken from the middle of the park, looking all around. This is a swimming pool, fire pit area and covered raised patio. They are all connected by beautiful hardscape pavers. The Virtual Tour Panorama was taken from just off the raised patio. This is a swimming pool, outdoor kitchen and a large gazebo – at night. The Virtual Tour Panorama was taken in from of the gazebo, and scanning the whole scene. This is a luxurious swimming pool, with an in-the-pool spa, requiring a bridge for access, and an elaborate sunken swim-up bar at one end. The Virtual Tour Panorama was taken from inside the bar, scanning the pool and it’s surroundings. Click on the Full Page button at the right-hand end of the controls at the bottom to see this magnificent instillation full page.